Daphne and Keith Gilbert began their Star Arabian Stud in 1971 when they purchased two gray mares from Crabbet. 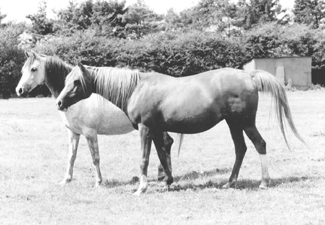 Those mares were AURORA (Oran x Shadowlight), who was foaled in 1966, and SELINA (Hanif x Dancing Diamond) foaled in 1968. Sadly, SELINA had died in 1999, AURORA the year before and their stallion INDIAN REFLECTION had passed away just a few months before my arrival in the summer of 2000. It seems my stud visit was far overdue and regrettably I had missed seeing these lovely Crabbet treasures. Aurora (Oran x Shadowlight by Indian Gold). Sweet photo. Several of my American customers have told me that I must meet Daphne and Keith Gilbert when I next go to England. I therefore made a point to include Lincolnshire on my route this past summer. Daphne had many reasons for getting involved in the Crabbet lines: she liked their temperaments, their way of going, and particularly, she could look up their pedigrees for these horses. Daphne said she enjoyed doing the research on the bloodlines, and found that with Crabbet Arabians, there were extensive materials for her passion of pedigree research. It seemed to her that other breeds simply did not have readily available stud books or written material like the Arabian horses. To this day, she can still recite the sires and dams of many Arabian horses. During the early years of their stud, Daphne, Keith and their two sons were deeply involved with showing horses, as their sons did a lot of mounted games on various partbred horses. Seems the whole family was often at shows each weekend during the show season, either with gaming events for the children, or showing their Arabians. During my visit, Daphne proudly showed me a video tape of her sons when they were young riders competing in these events. They were both very accomplished riders and the things that they were required to do on horseback were absolutely amazing. I have never seen anything like it. 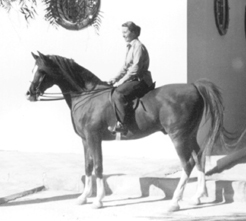 Daphne noted that there were not quite as many Arabian breeders back in those days, but those breeders that were showing their horses had been successful so the competition was intense. Daphne and Keith often showed against The Duchess of Rutland, The Maxwells, The Hedleys, The Linneys, The Marchioness of Townshend, and The Lindsays. Star Silver Akhbar x Selina by Hanif). Sweet photo. The first foal that the Gilberts bred was the stallion STARORA from their foundation mare AURORA by Darjeel. As a yearling STARORA was already a champion. His in hand wins include: 1975 Champion Lincolnshire Co. Show, 1975 1st Newark and Notts Show, 1975 4th East of England Show. STARORA was also a grade 1 race horse. In 1980 he raced and won at 1 mile, and took second at 1 mile 6 furlongs three different times, and was third in the 1980 AHS Marathon and First Place in the Purebred category. STARORA sired a grade one race horse but sadly STARORA died at a young age after an accident racing. 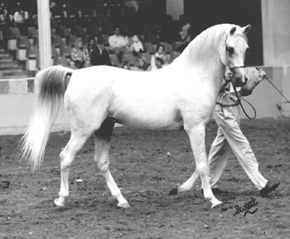 Their other foundation mare SELINA was bred to AKHBAR and foaled the Gilbert’s current stallion STAR SILVER in 1976. 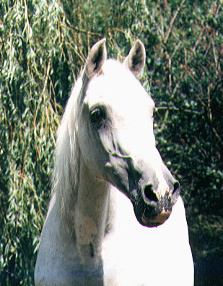 STAR SILVER is a beautiful stallion and now aged 24. 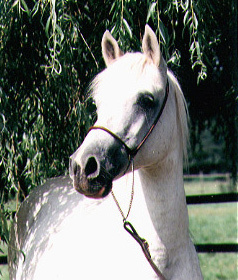 In 1984 SELINA produced STAR MELODY when bred to ASTAR. Star Melody is a 3/4 sister to Star Silver. Sapphire Star (Akhbar x Aurora), full sister to Astar. Sweet photo. In 1973 Daphne purchased the 1965 mare AL MARAH SPARKLE PLENTIE (Al Marah Indraff 10898 x Al Marah Shuayla 9027) from Barbara Campbell who imported her from Bazy Tankersley. Daphne bred her first to The Shah (at Hedleys) producing a filly, STARENTIE. Others produced from Al-Marah Sparkle Plentie: In 1975 SPARKLING STAR by Akhbar; in 1977 she had a filly STARDEE, also by Akhbar but died of grass sickness at age 3, and her last foal was STAR TREASURE by SHUFTI (Greatheart x Bint Astreelia). Sadly Sparkle Plentie died in 1979 a month after foaling Star Treasure . In 1973 AKHBAR (Indian King x Bint Astreelia) was purchased as a 5 year old. He placed third at the National Arab Show at Peterborough in 1975. This particular show was the Gilbert’s first Arab show. And what a debut they made! Al-Marah Sparkle Plentie came second in the broodmare class, her colt foal from Akhbar, SPARKLING STAR won his class. During the following year, Sparkling Star took third place as a yearling out of 26 exhibits at the Arab show. Sparkling Star was then sold to Tasmania where he won in hand and ridden classes at the Launceston National Show. 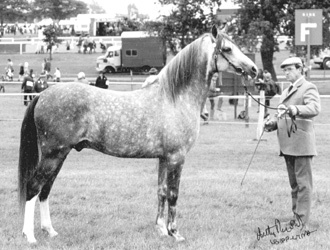 Sparkling Star also defeated all Champion stallions to win the Champion Stallon of the Show at the 1981 Devonport show. This is an award that not many, if any other Arabians stallions have ever been able to secure. He also won his Tom Quilty buckle in that famous 100 mile endurance ride of the same name. Akhbar (Indian King x Bint Astreelia) in Jordon with his new owner, the Royal Jordanian Stud. AKHBAR was sold in 1978 to the Royal Jordanian Stud. Daphne searched for Bint Astreelia’s only other son in the country. This was the stallion SHUFTI (by Greatheart) who was foaled in 1962. Daphne located him and purchased him in 1976. She owned him for seven years before he returned to the place of his birth in southern England. He died well loved at age 29. From about 1975 the Gilberts also owned the very well known and beautiful stallion IRIDOS (Irex x Rafeena) however he did not sire anything for them. He was at the stud for five years before he had to be put down. INDIAN REFLECTION (Indian King x Indian Surprise) foaled in 1970 was purchased in late 1987. He had only sired seven purebred foals when the Gilberts purchased him, but three of these had been shown successfully. The foals included Fayrelands Indian Prince who had been first Wales and West, third at Haydock (twice), fourth Arab Show plus equal points Futurity. Also INDIAN REFLECTION was the sire of several prizewinners including two 1st prizewinners at Newark and Notts. One of INDIAN REFLECTION’s sons, STAR REFLECTION, was sold to Clipper Winds Farm in New Salem, MA. There were two mares that were also owned by the Gilberts worth mentioning. One was RISSLANA (Oran x Rissalma), who only produced one foal before she proved unable to settle again. The other mare was FENELLA (Indian King x Azella) (the tail granddam of SHOGUN) who was sold in foal to Manto, as Daphne bought Akhbar (also by Indian King) about this time, and decided to retain Indian King breeding through him. The Gilberts have been successful breeders and have sold horses from their breeding program abroad. This includes six horses to the U.S.A, three to Ireland, and one each to Australia, Tasmania, Jordan, Denmark, Sweden, Norway, Belgium and Switzerland. Since their children have now grown up, the Gilberts now focus their attention to their caravan park business which they built and operate on their property. Although they maintain a herd of pure Crabbets there were no foals due for 2001, but a few horses are offered for sale. My visit with Daphne and Keith was memorable in particular because of Daphne’s extensive collection of scrapbooks. She has been collecting many fascinating photographs and newspaper article clippings throughout the years, and most have to do with past Arabian horse shows (when the Arab show was held at Roehampton for example). She also has articles about horse owners, and general horse handling articles. There are also articles written by Lady Wentworth included in these scrapbooks. These scrapbooks are fascinating to peruse, and I only wish I had enough time to read them all. The Gilberts are an entertaining couple with a joyful look on life. They are active farmers, caravan park managers and guardians of the pure Crabbet horse. Daphne has many interesting stories and an encyclopedic mind when it comes to pedigrees. Her horses have carried the banner for Crabbet not only in hand, but under saddle, and have done so in many areas of the UK and in other countries. 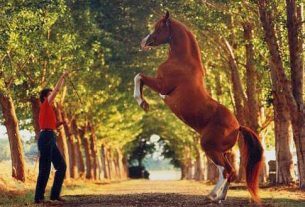 A visit to Star Arabian Stud will leave you wanting for more time to stay. A young Astar (Akhbar x Aurora) shown in hand. 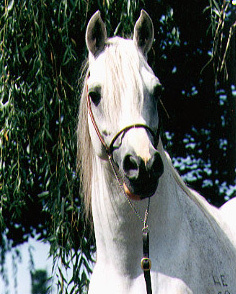 1) STAR SILVER (Akhbar x Selina) 15 hands, 1976 gray stallion. He has a pretty head, long neck, and is tall and beautiful. – Show record: 1988 Res. Champion Kent Co. Show, 1988 2nd Essex Co. Show, 1996 Third at AHS Malvern, 1997 Third at U.K.I.A.H.S. Towerlands. 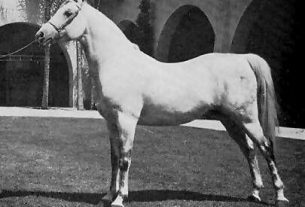 SAPPHIRE STAR (Akhbar x Aurora) 1975 gray mare. CRYSTAL SUNSET (Rafid x Grey Crystal) 1980 chestnut mare. Sadly died 2001.